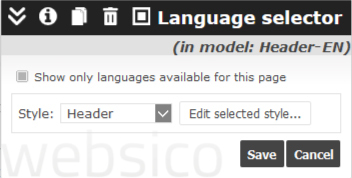 In a multilingual site, the component language selector allows the visitor to choose the language of consultation. The system supports all encodable languages in Unicode UTF8 (varied character sets and not necessarily Latin ones: japanese, cyrilic...). For the flag of a country to appear automatically in the language selector you must give the corresponding language code in "administration page”. To display the flags on one or more lines you must vary the absolute width of the component by the changes in appearance.